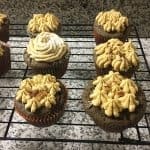 I love chocolate cupcakes, but who decided to turn peanut butter into frosting?! Seriously, I want to meet this beautiful soul and explain to them how much they’ve changed my life. If it was digging into some PB snack packs and graham crackers during a midnight shift at the hospital, paired up with jelly when my cupboards are bare and I’m being stubborn about grocery shopping, or served up on a spoon to my dog…Peanut Butter is that sweet baby angel in your cupboard that never lets you down. I love making cupcakes, but I have a confession. I HATE decorating them. These chocolate cupcakes are so delicious, and it really is worth the little bit of extra time required as compared to a box mix. Basic cupcake recipes are great since you can make so many different variations with garnishes and fillings. Use an ice scream scoop with a little scoop “lift” to serve up the perfect amount of batter. Works for me every time! Prepare to make a mess with the powdered sugar in the frosting. There is no avoiding this, so just embrace the chaos that will be your kitchen. The frosting calls for softened butter. Reading this ingredient in a recipe is always followed with me groaning UGH! I never remember to take ingredients out to soften. The good news is you can simulate softened butter by microwaving the stick of butter in 5-second increments, rotating the butter after each interval. I found that a total of 20 seconds with a 5-second zap on each side of the butter did the trick. When my husb-….errr, I mean when I frosted these cupcakes, I used a plastic piping bag. You could easily use a Ziploc bag with the corner snipped off. I do recommend if you decide to use a tip attachment, piping bags would be the best item to use! He said his piping skills need some work, but this video is super helpful if you’re not an expert (and we aren’t either)! Have fun making these cupcakes, and let us know what delicious variations you come up with (or if you decided to stuff them with jelly 😊 )! Preheat oven to 350 degrees. Prepare your cupcake pans with cupcake liners and set aside. Sift together the flour, baking soda, salt, and baking powder. Mix the hot water and cocoa in a separate bowl until dissolved. In a larger bowl, beat the shortening on medium speed for approximately 30 seconds. Gradually add the sugar to the shortening, beating well after each addition. Beat 2 minutes longer after all of the sugar has been added. Beat in the vanilla to the shortening and sugar, and then alternately add the flour mixture and dissolved cocoa to the batter. Be sure to mix the ingredients until just combined. Fill each cupcake liner 2/3 full and bake in the 350 degree oven for 20-25 minutes. Allow to cool for 5 minutes before removing from pan, and cool an additional 10 minutes on a wire rack before frosting! Beat the softened butter and creamy PB with an electric mixer. Slowly mix in the sugar, and then add the milk to form a fluffy, spreadable frosting. 3 minutes is the magic number for mixing to achieve that delicious texture! Frost as desired on chocolate cupcakes...and garnish if you're feeling fancy! If you’re still looking for something sweet, you should check out these easy apple cinnamon baked donuts!